The soil on Mars could be identical almost everywhere showing that, like on the Moon, its composition is unrelated to the immediately underlying rocks. Study by the US rovers which touched down in January would suggest the soil has been mixed up by wind and impacts. 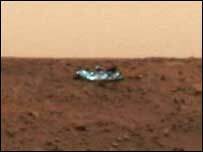 Its make-up is roughly the same as that found at the landing sites of the two Viking landers in 1976 and the Mars Pathfinder mission in 1997. Nasa revealed the soil data at the 2004 Lunar and Planetary Science Conference. The first results from the Spirit rover that landed in Gusev Crater and the Opportunity rover that set down in Meridiani Planum are being discussed by scientists at this week's conference in Houston, Texas. Part of the rovers' Athena science package includes an Alpha Particle X-Ray Spectrometer (APXS) that is able to determine soil composition. Its spectra data suggests the soil is the same in many regions of the planet having been redistributed by wind and churned-up by impacts. Researchers are also outlining their understanding of the history of Gusev Crater. They suspect that, billions of years ago, a large amount of unsorted rocky debris was deposited into the crater during flash floods. They believe that it acted as a settling pool for sediments carried by water that cut the nearby Ma'adim Valley. They are unsure how long the water stood but suspect that it was not very long on geological timescales. Later, when the water had gone, the region was covered in a thin layer of volcanic deposits and in the billion years that followed small impacts disrupted the surface. Spirit is currently analysing a drift of windblown material dubbed the "serpent". Mission planners said at the conference that it would stay in the locality for a further three weeks before it headed towards the eastern hills. They added that it would not go and visit its discarded heatshield, which can be seen in its images, as that would be too much of a detour. 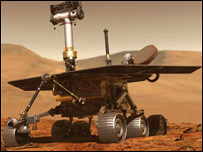 Opportunity is currently in Eagle Crater analysing a rock outcrop by using one of its wheels to test the rock's hardness. It will next go to examine Endurance Crater. Following that it will visit its discarded heatshield before it sets off for what scientists are calling "exciting terrain" about 2.5km away. Some have said privately that if there is any possibility of seeing signs of life in the rocks - highly unlikely but possible - they will see it when Opportunity gets there. Mission scientist Steve Squyres said the rovers were performing well and would keep going until at least their 240th day on Mars.